Stakeholder input is integral to a successful Facilities Master Plan. Their participation ensures that the Master Plan solutions truly meet their day-to-day needs as well as the academic vision of the District. The FMPC is comprised of a diverse group of District leadership, school site representatives, civic organizations staff, and local community stakeholders. Meetings are intended to develop broad visioning concepts and to review and provide input on the development of the site master plans and the proposed prioritization of projects. Participants on the committee function as communication ambassadors to their representative stakeholder groups. The Facilities Master Plan Committee meeting series is underway. Meeting Minutes and Presentations can be downloaded by clicking the links to the right. Each site forms its own SSC who are intended to interact with the planning team to develop and confirm the specific master plan proposal for each site in the District. Interaction with these site stakeholders includes attendance at their community Town Hall in February 2019 and a follow-up ‘1-on-1’ meeting with LPA in March 2019 to convey the feedback on the proposed site diagrams. Open to the entire Mt. Diablo USD community, attendees also include the FMPC and SSCs. Following a presentation on the Facilities Master Plan process-to-date, attendees view the Draft Master Plan proposals and are encouraged to react, make written comments, and ask questions of the design team. Between the Town Hall and the follow-up ‘1-on-1’ meetings with the Principals, each School Site Committee is tasked with engaging their local community stakeholders as they best see fit to meet the needs of their site. The feedback received from these stakeholders will be conveyed in a one-hour ‘1-on-1’ meeting with LPA staff. Due to the district’s large size, sites have been organized between 6 Town Hall meetings. 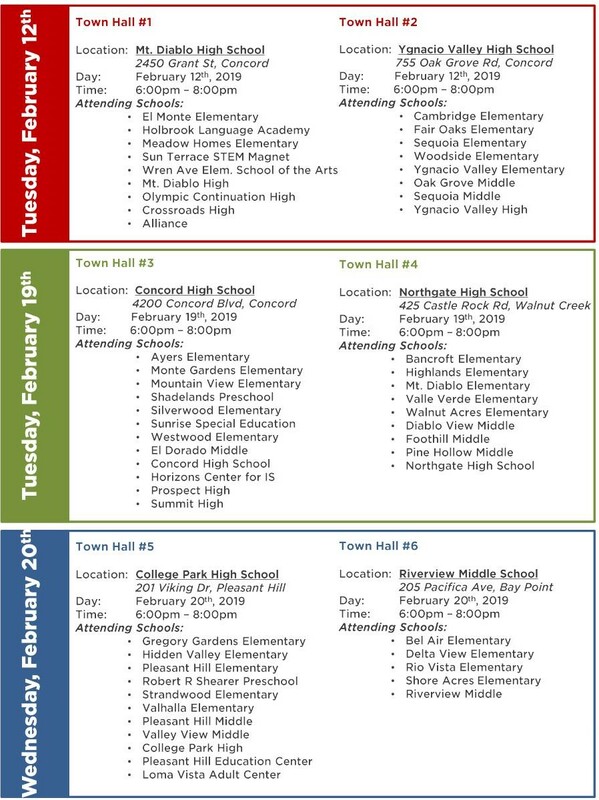 Refer to the schedule below to find the Town Hall relevant to your school site. A general Town Hall Presentation is available to download through the link to the right. Throughout the process, LPA gives periodic updates to the Mt. Diablo USD Board of Education. Presentations from LPA to the Board of Education can be downloaded by clicking the link to the right. For the full presentation, including Board comments and discussion, please visit the MDUSD website. Individual meetings are held with the District’s various trades and department heads as part of the information-gathering phase of the master planning process. Conversations revolve around the existing operations (staff, space uses, and functionality) and inquire about the ideal configuration of each department or trade. The groups engaged for this process have been: Elementary and Secondary Programs, Special Education, Adult Education, Instructional Support, Maintenance and Operations, Food and Nutrition Services, Technology and Information Systems, and Transportation. Taking information learned during the Focus Group meeting with the educational program directors, a charrette (workshop) was later held with District-selected teacher-leaders to better understand the way programs are currently being implemented and how facilities could better assist the learning environment. The information gathered during this charrette is used to create the Program Vision documents. During the charrette, those attending were taken on an exploration of learning spaces throughout the course of the day. The activities were about leaving behind any constraints of ‘today’ and focused on visioning for future possibilities. In this experiential travel, the destination is the Mt. Diablo learning spaces of the future – spaces designed to support the aims of the MDUSD Graduate Profile. The charrette provides valuable information for the design team and will encourage participants to think about the connection between physical spaces and learning goals. ©2019 LPA, Inc. All Rights Reserved. Have comments? Contact Mt. Diablo USD.